A legendary American company. Stetson sells Hats, Boots, Western Apparel, Eyewear, and Fragrance. At Stetson, they believe deeply in the values of the American west: INDIVIDUALITY, INTERGRITY, and LASTING STYLE. Stetson creates products to provide and authentic American experience. In 1865, John B. Stetson fashioned the hat that would become the symbol of American independence, individuality, integrity, and strength. Today every thing that carries the Stetson brand, from authentic Westernwear to rugged Actionwear to contemporary Street wear, stays true to these American values: Make things right and the best they can be. In this area of the Apparel Search fashion brand directory, you will find men's fashion brands from leading apparel companies and fashion designers. On this particular page, you will find information regarding men's clothing with the Stetson brand. You are welcome to utilize this section of our clothing guide to review Stetson news, Stetson blog posts, Stetson photos, and more. Please understand that you may run into a few photos or a tad of information that does not actually pertain to the men's Stetson fashion brand. Unfortunately, no search technology is absolutely perfect. We will continue to do our best to bring you as much information about the men's Stetson fashion collection as possible. Stetson embodies the authentic, resourceful, and diverse American spirit. This company and brand is rich in history. They have been in business for over 150 years. What is a cowboy hat? A cowboy hat is a high-crowned, wide-brimmed hat best known as the defining piece of attire for the North American cowboy. Influenced by 19th century Mexican culture, today it is worn by many people, and is particularly associated with ranch workers in the western and southern United States, western Canada and northern Mexico, with country-western singers and ranchero singers in Mexico, and for participants in the North American rodeo circuit. It is recognized around the world as part of Old West lore. The shape of a cowboy hat's crown and brim are often modified by the wearer for fashion and to protect against weather. Today's cowboy hat has remained basically unchanged in construction and design since the first one was created in 1865 by J.B. Stetson. In addition to hats this long admired brand sells denim, shirts, boots, and more. Learn more about Steston at their website. Learn more about Stetson in the fashion company section. If you have changed your mind and do not wish to research the brand Stetson, you can use the search engine on this page to find another clothing label that may be of more interest. Apparel Search is a leading guide to fashion, style, clothing, glam and all things relevant to apparel. We hope that you find this Stetson page to be helpful. 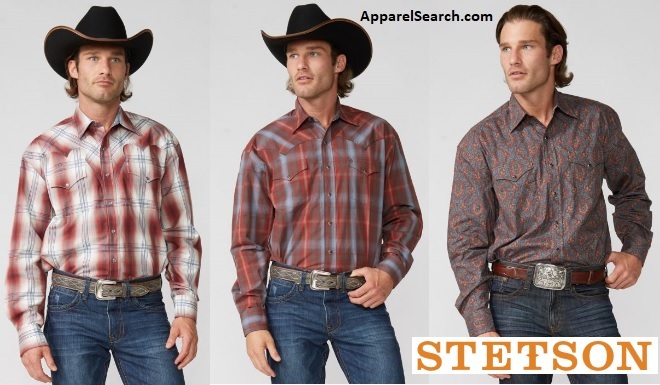 The westernwear clothes that you are wearing today is most certainly in style.